IBM Sterling B2B Integrator is the industry-leading B2B integration solution that allows you to connect all of your B2B applications, networks, and systems through a single gateway. Sterling B2B Integrator is the trusted solution for enterprises and large organizations with complex supply and demand chains spread throughout the world. IBM Sterling B2B Integrator connects your EDI solution to your other B2B integrations – simplifying supply chain operations, securing communication networks, and improving scalability. As an IBM Business Partner, Focused E-Commerce has successfully implemented Sterling B2B Integrator for Fortune 100 and Fortune 5 Global companies. We will take on the intimidating process of integrating all of your B2B processes and optimize your solution to ensure you get the most value from your investment. What is IBM Sterling B2B Integrator? Businesses rely on IBM Sterling B2B Integrator to take control of and simplify their growing supply chain and trading partner networks. Its capabilities extend further than other EDI and B2B integration solutions because IBM Sterling B2B Integrator has the flexibility to create seamless connections between a wide variety of platforms. Flexible support for B2B data formats and protocols – IBM Sterling B2B Integrator supports multi-gigabyte file handling, policy-based file transfer, web services (SOAP), HTTP, HTTPS, S/FTP/S client and server, AS1, AS2, AS3, SMTP, RosettaNet, Zengin TCP/IP, WebDAV, and IBM Sterling Connect:Direct. Any-to-any data mapping/translation – Includes a multi-purpose data transformation engine and graphical data mapping tool to support all common EDI standards, XML standards, and Internet standards for B2B data transactions. Document processing – Creates end-to-end process automation through document conversion, routing, delivery, exception handling, and business rule validation. Over 300 adapters – Includes adapters for enterprise solutions, such as all IBM solutions, Oracle, SAP, PeopleSoft, GXS, Siebel, JD Edwards, Manugistics; adapters for EAI messaging, such as Oracle AQ, TIBCO Rendezvous, BEA Tuxedo, and IBM WebSphere MQ; other adapters for CORBA, JDBC, and instant messaging platforms. First-class security – Leverages encryption, advanced authentication, digital certificates, role-based data access, and security for data transport. End-to-end visibility – Provides business process tracking to identify and solve issues in real-time before they become severe problems. Reporting dashboard – Monitors important KPIs and provides various overviews of business documents. Intelligent onboarding – Uses partner self-provisioning to simplify trading partner onboarding process. Mobile tools – Provides tracking and management of business processes, monitoring of system performance, and allows administrators to start and stop key functions. IBM Sterling B2B Integration Services Basic is an integration-as-a-service platform that automatically converts documents into their required format and exchanges them with trading partners securely. IBM Sterling B2B Integration Services Plus adds B2B process management from IBM B2B experts, in addition to the integration-as-a-service platform. IBM Multi-Enterprise Integration Gateway – Provides high availability for AS2 and AS4 networks, ensuring your trading partner network never has downtime. IBM Sterling Control Center – Offers enhanced visibility over multi-enterprise processes. IBM Sterling Secure Proxy – Uses DMZ-based security for greater threat protection in B2B transactions. IBM WebSphere Transformation Extender – Supports continually changing industry data standards as new standards are released. IBM Sterling File Gateway – Consolidates all B2B integration use cases into one platform through file-based B2B integration. Is IBM Sterling B2B Integrator Right For Your Business? IBM Sterling B2B Integrator is a powerful, flexible platform designed to accommodate enterprises with complex B2B processes and communication systems. Large businesses that need more control and better visibility of their supply and demand chains will find that Sterling B2B Integrator is the answer to their problems. Learn more about IBM Sterling Gentran. Once your business reaches the point where your B2B applications are too fragmented and scaling your operations seems impossible, IBM Sterling B2B Integrator is a wise investment. IBM provides a smooth migration process for customers who start with a smaller platform, and we can also help you implement new IBM solutions in your business. Enterprises, manufacturers, healthcare providers, and other large organizations work with a wide variety of business partners around the world to meet the needs of their customers. All of those B2B processes and the high volume of B2B transactions makes it difficult to optimize business processes for efficiency and scale. IBM Sterling B2B Integrator simplifies those complex systems by providing secure, reliable integration of all B2B processes and integrations through a single gateway. As a result, organizations become better organized, more efficient, and their B2B relationships are improved. Focused E-Commerce has experience with all of the major ERP solutions, EDI, and IBM’s full suite of products and services. We can implement IBM Sterling B2B Integrator in your organization and ensure all of your existing applications and systems are integrated correctly. With a mapping library of over 10,000 maps, Focused E-Commerce is the right choice for any size business looking for IBM EDI solutions. 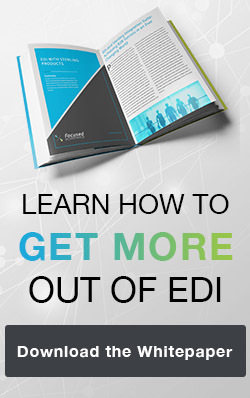 Let us implement EDI with your providers!